Nagarjuna Sagar is a beautiful region in the Nalgonda district of Telangana and is popular amongst locals as well as tourists for Nagarjuna Sagar Dam, which has the second largest water reservoir in the country. However, it is also famous for its lush green surroundings which are blessed with rich vegetation and beautiful waterfalls. Therefore, over a period of time, it has become an ideal weekend getaway for tourists and travellers. It is located in the close proximity of Hyderabad and is easily accessible by road. So, what do you think about making your weekends refreshing and memorable? If you would love to do so, plan a trip to Nagarjuna Sagar now. Read on to know more about this mesmerising place and how to reach it. The region in and around Nagarjuna Sagar experiences an extreme type of climate, and hence it is not a preferred destination amongst tourists during the summer season. However, for locals and offbeat travellers, it is a year-round destination. If you are looking forward to avoiding the heat of its summer, then the best time to visit it is from October until the end of March. By Air: If you are starting your journey at Hyderabad, there is no option available of reaching Nagarjuna Sagar by air as the nearest airport is located in Hyderabad itself. By Rail: If you desire to travel by rail, then you can take a direct train from Hyderabad to Nadikudi Junction and then from there, you can either hire a cab or use the public transport to reach Nagarjuna Sagar. The distance between Nadikudi and Nagarjuna Sagar is 60 km. By Road: Being a popular tourist centre in Telangana, the region of Nagarjuna Sagar has a good road connectivity and is well connected to all other cities including Hyderabad by road. If you would want to reach your destination within minimum time, then it is advisable to take route 1 as it will take just 3 h, i.e., half an hour lesser in comparison to the other route. Once you are on your way, do not forget to take a break at Devarakonda and explore its beautiful surroundings. Devarakonda is located at a distance of about 104 km from Hyderabad and 58 km from Nagarjuna Sagar and is a perfect en route stoppage. It is the place where you can enjoy history as well as nature simultaneously. The region of Devarakonda is blessed with beautiful hills and green vegetation, and therefore it is also good for photography. The major attractions here include Devarakonda Fort, which, despite lying in ruins, allures several tourists. Nagarjuna Sagar is located at a distance of about 153 km from Hyderabad and is a beautiful getaway for those who always look forward to savouring the beauty of nature. It is one of the few places in Telangana where you can enjoy forests, wildlife, waterfalls and lakes. Following is the list of the major places in and around Nagarjuna Sagar which must be explored by you. Built across the Krishna river in the Nalgonda district and surrounded by forests and lush vegetation, Nagarjuna Sagar Dam is one of the most visited tourist attractions in the region. It is one of the largest and tallest dams not only in India but on the planet! Therefore, it attracts tourists from all over the state. The major things to do here include boating, fishing and photography. The enthralling scenery of the sun at the time of dusk is certainly breathtaking. 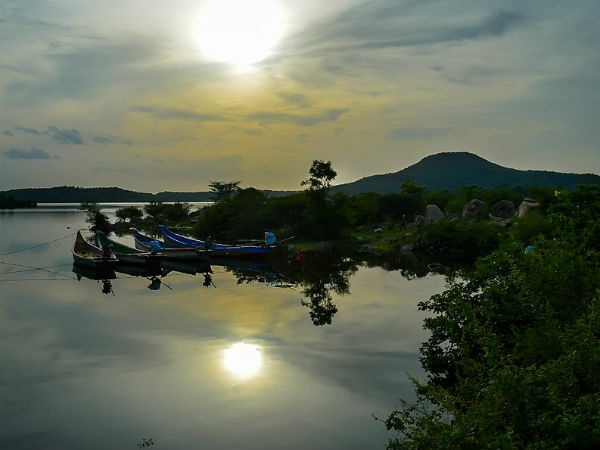 So, do not forget to bring your camera while on your trip to Nagarjuna Sagar. If you love lazing by natural expanses and listening to the melodious gushing of a waterfall, then Ethipothala Waterfall should be your stoppage while in Nagarjuna Sagar. Located on Chandravanka river, this enchanting beauty is all you need on your weekends to soothe your nerves. It falls from a height of about 70 ft and is situated at a distance of about 15 km from Nagarjuna Sagar. How about finding yourself capturing the captivating beauty of richly diverse wildlife? If you are keen on doing so, then Nagarjuna Sagar Wildlife Sanctuary is you calling. Established in the year 1983, it is a tiger reserve and is home to some of the most beautiful and rarest species of plants, animals and birds. The major species which can be spotted here include tiger, leopard, Indian peafowl, chinkara and sloth bear. If you think you are not satisfied even after exploring the above-mentioned attractions, then you can also plan a visit to Nagarjunakonda, a historical town with several age-old Buddhist sites, Macherla and Nagarjunakonda Museum.